Family Time Records press sheet description: "On his 12” vinyl debut, Greenspon has written and arranged seven songs blending elements and techniques from ambient, drone, field recording, and harsh noise sub-genres into a concise album that seamlessly covers a wide variety of musical ground. 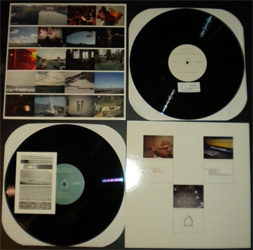 Taking a refined approach to actual songwriting in lieu of the unplanned improvisation or loose experimentation of his contemporaries, Greenspon has woven "Common Objects" into a personal and emotionally moving narrative chacterized by his trademark guitar tones, reminiscent of classical string instruments, lush synthesizers and AM radio interference." Family Time Records edition of 530 12" vinyl records packaged in glossy heavyweight jackets with insert and digital download. Bridgetown Records tour edition of 25 chrome cassettes dubbed in real-time with full-color labels and doublesided printing on heavyweight matte stock.